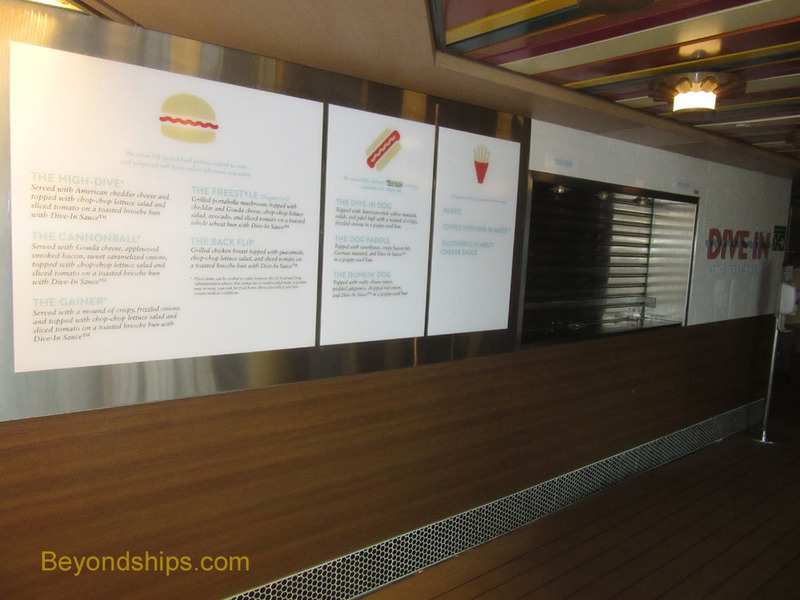 Holland America has joined in the battle between the cruise lines for the best burger at sea. As previously reported, Carnival Cruise Lines, Norwegian Cruise Lines and Royal Caribbean all have entrants in this contest. Holland's entry is the Dive-In Burger Bar. We sampled this venue on the Westerdam. The Dive-In uses the former hamburger grill on the starboard side of the main pool area. A new white facing has been added around the window, which gives it a new livlier look. To the left of the window are panels with the menu written on them. Listed on the panel furthest to the left are two burger combinations, a vegetatrian mushroom burger and a chicken sandwich. The next panel lists the hot dog offerings and emphasizes that these are made with genuine Nathan's beef hot dogs. Finally, closest to the window are the listings for the fries. These can be had “naked”, with Dive-In Sauce or with the Dive In's melted cheese. Although not listed on the menu panels, you can order just a plain hamburger or cheeseburger. You can also ask to have one of the burger combinations without one or more of the listed ingredients. Thus, if you want a “Cannonball” without bacon, the staff will oblige. Since all of the dishes are made to order, it is no problem to hold a particular ingredient. Once you have decided on what you want, you approach the waiter who stands by the window. He writes down your order on a slip and then hands you a pager. The pager will tell you when your order is ready. 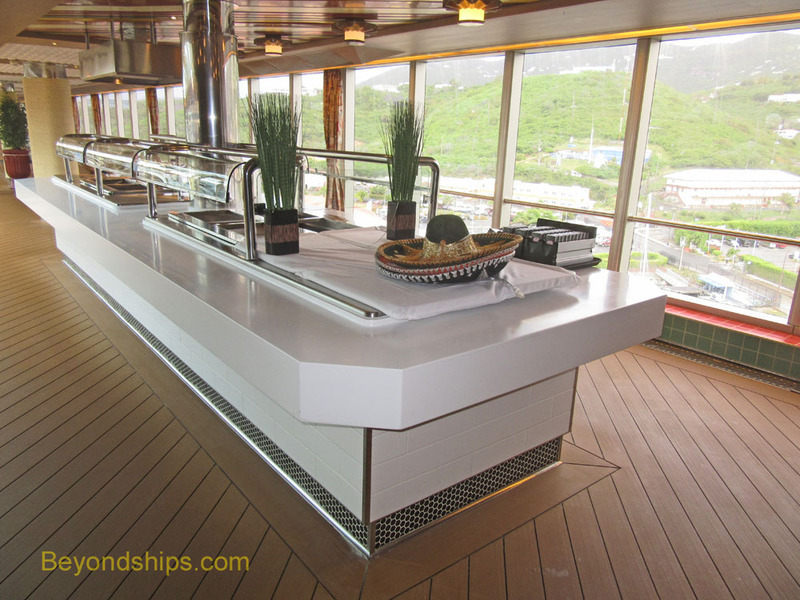 The pager's range includes the main pool area and the Lido buffet restaurant. However, it does not extend to the aft pool area. Thus, you have substantial but not complete freedom to do other things while your order is being prepared. The burgers are freshly made. No frozen patties are used. They are cooked as ordered and then assembled along with the various additions. There are no burger combinations standing by under warming lights even during the peak hours. Thus, everything tastes fresh. Of course, to cook each dish fresh takes time. Consequently, there is a wait of 10 to 20 minutes between the time that you place your order and the pager alerts you that it is ready. If you really must eat something right away, there is a taco buffet next to the Dive In, where you can build a taco from a selection of ingredients. Alternatively, you can go into the Lido and grab something from the buffet. Of the burger combinations, we liked the Cannonball best. Here, the burger comes with gouda cheese, smoked bacon, carmelized onion, lettuce and tomato on a brioche bun. Adding flavor is the Dive-In Sauce, which is somewhat reminiscent of Thousand Island dressing. 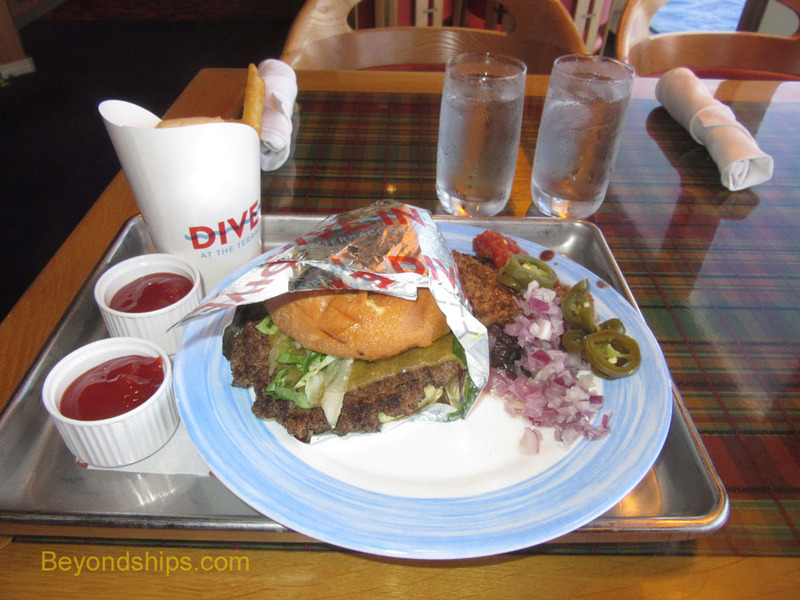 A very tasty alternative to the standard veggie burger is the Dive-In's Freestyle. The centerpiece of this sandwich is a large slice of portabella mushroom. This is topped with slices of cheddar and gouda cheese. Avacado, tomato and lettuce with the Dive-In's special sauce round out the ingredients. All of this is on a whole wheat bun. Above: The Taco Bar adjacent to the Dive In. We were not expecting anything special from the hot dogs. After all, a hot dog is a hot dog. However, the Dunkin Dog was a pleasant surprise. The Nathan's beef burger does have more flavor than your typical hot dog. 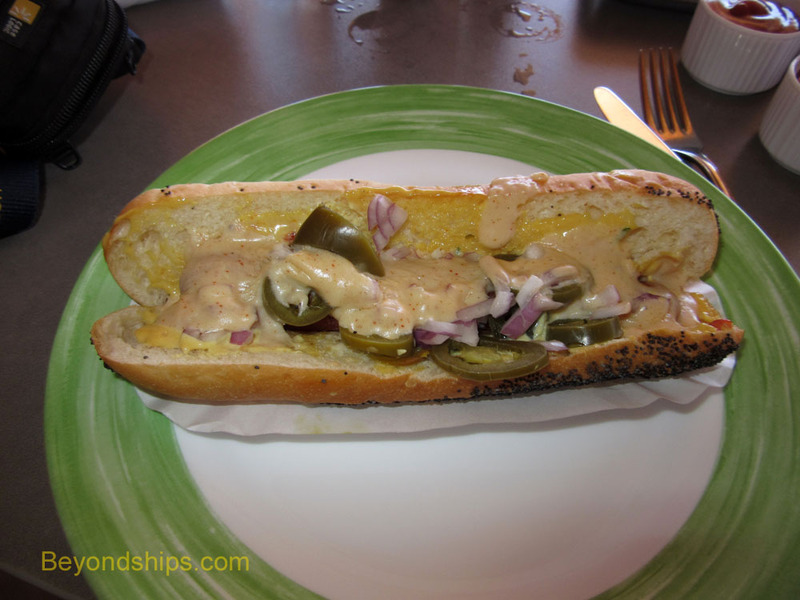 Furthermore, the inclusion of melted cheese, jalapenos and red onion in the poppy seed roll gives the hot dog personality. 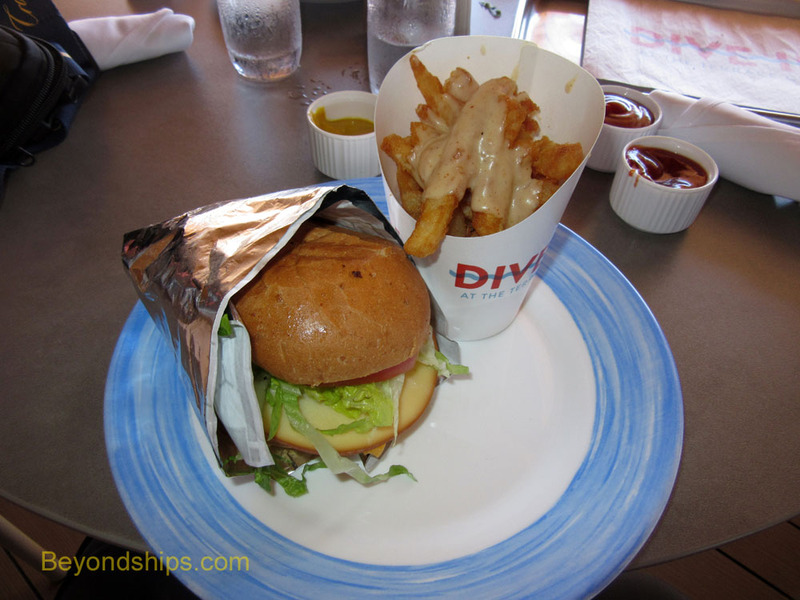 The Dive-In Burger Bar is open each afternoon and is complimentary.